Handcrafted Balinese Onyx and Peridot Pendant Necklace, "Leaf Fairy"
Komang Suastra handcrafts this modern Balinese necklace of mystical beauty. 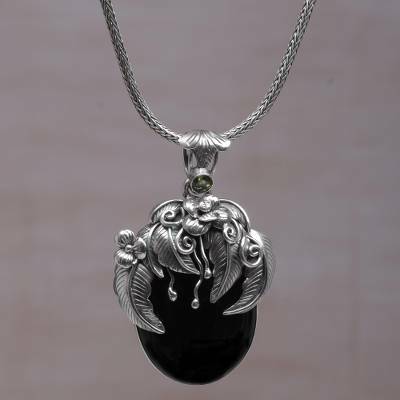 Deep black onyx crowned with sterling silver leaves forms the pendant, with a small sparkling peridot gleaming brightly at the top. This item even surpassed my expectations! Wonderful! The craftsmanship, the design, the large bail?top notch! Thank you. I also appreciate the lovely box and the hand written note.